Diploid-Triploid Mosaicism is a chromosome disorder. Individuals with diploid-triploid syndrome have some cells with three copies of each chromosome for a total of 69 chromosomes (called triploid cells) and some cells with the usual 2 copies of each chromosome for a total of 46 chromosomes (called diploid cells). Having two or more different cell types is called mosaicism. What are the Signs and Symptoms of Diploid-Triploid Mosaicism? How is Diploid-Triploid Mosaicism Diagnosed? What are the possible Complications of Diploid-Triploid Mosaicism? How is Diploid-Triploid Mosaicism Treated? There is no cure for Diploid-Triploid Mosaicism, since it is a genetic condition. The treatment is usually given to manage the signs and symptoms and any complication that develops. How can Diploid-Triploid Mosaicism be Prevented? 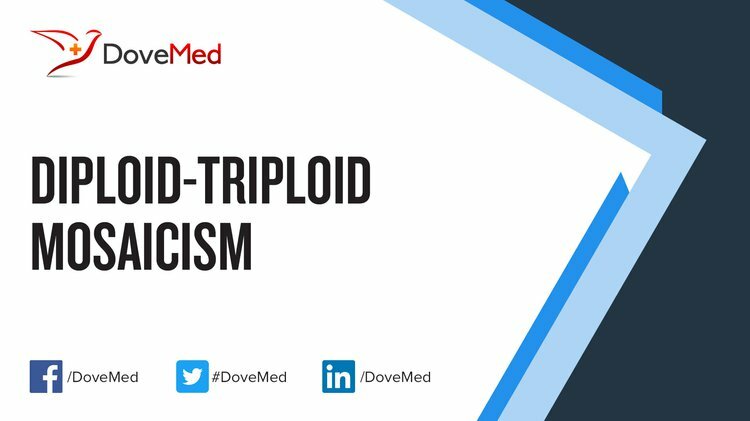 Diploid-Triploid Mosaicism may not be preventable, since it is a genetic disorder. Ferrier, P., Stalder, G., Bamatter, F., Ferrier, S., Buehler, E., & Klein, D. (1964). Congenital asymmetry associated with diploid-triploid mosaicism and large satellites. The Lancet, 283(7324), 80-82. Bickham, J. W., Tucker, P. K., & Legler, J. M. (1985). Diploid-triploid mosaicism: An unusual phenomenon in side-necked turtles (Platemys platycephala). Science, 227(4694), 1591-1593. Schmid, W., & Vischer, D. (1967). A malformed boy with double aneuploidy and diploid-triploid mosaicism 48, XXYY/71, XXXYY. Cytogenetic and Genome Research, 6(2), 145-155. Tharapel, A. T., Wilroy, R. S., Martens, P. R., Holbert, J. M., & Summitt, R. L. (1983). Diploid-triploid mosaicism: delineation of the syndrome. In Annales de genetique (Vol. 26, No. 4, pp. 229-233). Van De Laar, I., Rabelink, G., Hochstenbach, R., Tuerlings, J., Hoogeboom, J., & Giltay, J. (2002). Diploid/triploid mosaicism in dysmorphic patients. Clinical genetics, 62(5), 376-382. Carakushansky, G., Teich, E., Ribeiro, M. G., Horowitz, D. D., & Pellegrini, S. (1994). Diploid/triploid mosaicism: further delineation of the phenotype. American Journal of Medical Genetics Part A, 52(4), 399-401. Jenkins, M. E., Eisen, J., & Sequin, F. (1971). Congenital asymmetry and diploid-triploid mosaicism. American Journal of Diseases of Children, 122(1), 80-84. Pettenati, M. J., Mirkin, L. D., Goldstein, D. J., Opitz, J. M., & Reynolds, J. F. (1986). Diploid‐triploid mosaicism: Report of necropsy findings. American Journal of Medical Genetics Part A, 24(1), 23-28. Rittinger, O., Kronberger, G., Pfeifenberger, A., Kotzot, D., & Fauth, C. (2008). The changing phenotype in diploid/triploid mosaicism may mimic genetic syndromes with aberrant genomic imprinting: follow up in a 14-year-old girl. European journal of medical genetics, 51(6), 573-579. Perandones, C., Cerretini, R., Bozzo, W., Banares, V., Alba, L., Sala, A., ... & Mühlmann-Diaz, M. C. (1998). Diploid-triploid mosaicism in chorionic villus sampling (CVS): Clinical significance and prenatal assessment. BioMedicina, 1, 425-428.